Initial gliding instruction and introductory flights are provided by our onsite operation Jersey Ridge Soaring , located at the airport. The FAA requires no medical exam for glider pilots and anybody who is fit enough to drive a car can fly a glider. Once a student has passed his exam he/she can start flying our club gliders. ACA encourages and provides great progression in gliding. 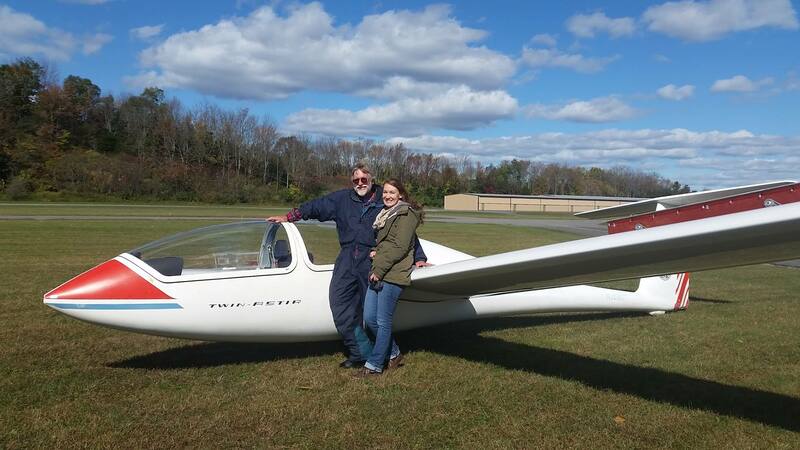 With our fleet of gliders you can progress your flying from a docile easy-to-fly glider to more advanced high performance fiberglass gliders at low cost. We promote members to badge and cross-country flying. Members can progress through the SSA badge system from Bronze, Silver up to Diamond and earn their badges in our club gliders. Many members have achieved Diamond badges (consisting of a 300km and 500km flight and a 5000m altitude gain) in our club gliders. We provide ridge and cross-country training in our high-performance two seater Grob 103 to our members who want to progress to more advanced cross county flying. Many club members enjoy contest flying. Glider Racing is cross country flying in the form of a competition. The challenge is to go around a course defined by a set of turnpoints as fast as you can. A flight recorder is used to record GPS traces and allows full 3D flight replays and analysis. In competitions the trace from this recorder is used to calculate the winner. For pilots who are interested in learning competition flying, we fly with our Grob 103 in two-seater classes (bus class) at regional contests. As a “contest student” you fly with one of our experienced contest pilots on one or several days during the contest and learn the art of contest flying.